Starting in February, webinars will be held live on the 4th Tuesday of the month at 2 p.m. Eastern Time. (Plus a bonus webinar in March!) The November and December dates have been moved to avoid conflicting with major holidays. Each webinar will be recorded and available online for later viewing as well. Please note this list is subject to change. 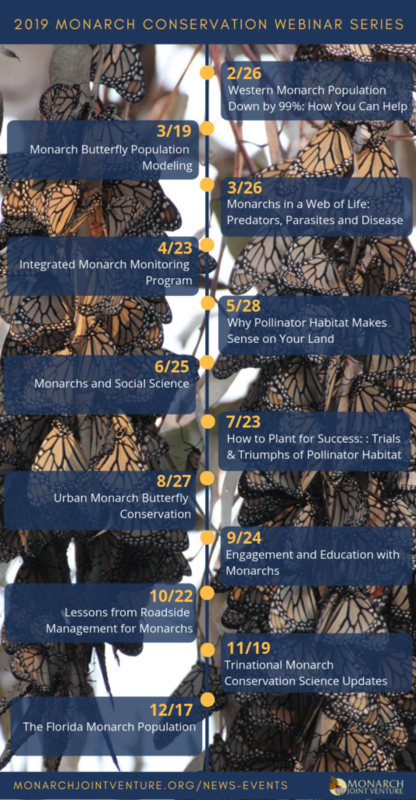 Our events page will have the most up to date information on our webinar series, as well as a calendar of additional monarch-related events.